Good news! Fate/EXTELLA LINK won’t just be hitting the Nintendo Switch in Japan, for Marvelous have now announced a Western release as will, which also includes special bundles for both Switch and PlayStation 4. 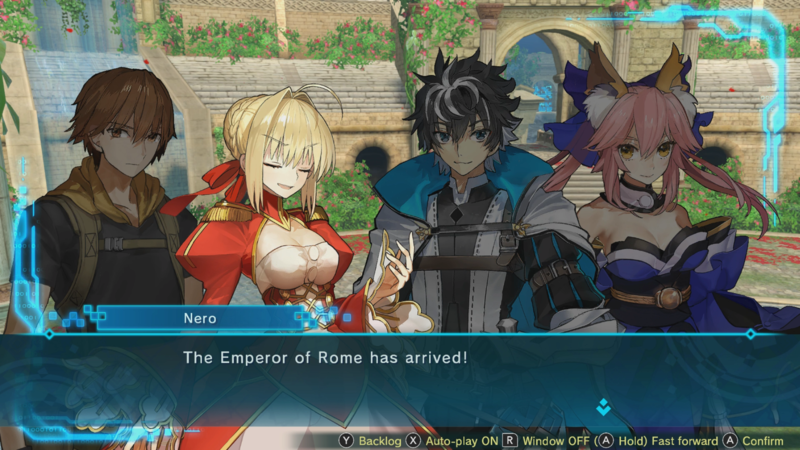 Tunbridge Wells, England – 14th November 2018 – Fans of the ever-popular Fate series only have a short while more to wait for the next instalment in the growing franchise, with Fate/EXTELLA LINK set for release in the first quarter of 2019 across Europe for Sony PlayStation 4, PlayStation Vita, Nintendo Switch and Windows PC via STEAM. Marvelous Europe has today also announced two special Limited Editions of the game for PlayStation 4 and Nintendo Switch, titled Emperor of Paladins Edition and Joyeuse Edition, both containing a plethora of collectors’ items for fans to savour. Alongside the game itself, the Joyeuse Edition contains a soundtrack CD, a pack of 10 collectible 7.6cm by 12.7cm cards depicting each of the new Servants, a 43.1cm by 60.9cm cloth poster, and a 7.6cm by 11.4cm. The Emperor of Paladins Edition includes the same contents plus a stunning set of ‘Holy Tile of the Moon’ Mahjong tiles featuring characters from the Fate/EXTELLA franchise. Picking up right where the 2017 smash hit Fate/EXTELLA: The Umbral Star left off, Fate/EXTELLA LINK adds 10 servants to the original roster of 16. The high-speed action gameplay has been refined, and players will battle their way through massive invading armies to retake the virtual world of SE.RA.PH from an invading force. Players on the PlayStation 4 and Nintendo Switch can now engage in massive four-on-four online battles with up to seven other players. Foes will quiver at the True Name of players’ Noble Phantasms as they assume the role of their favourite Servant. Combatants from Across the Fate Universes Join the Fray – In addition to the 16 original Servants from Fate/EXTELLA: The Umbral Star, 10 characters from other Fate series will enter battle as playable Servants, including Astolfo, Scáthach, and Francis Drake. Hunker Down in Base Camp – Players can move freely around their army’s base camp — a medieval cathedral raised into the sky — and interact with their Servants to build meaningful bonds. Polished Graphics and Battle Mechanics – Players can experience refined combat mechanics and graphics throughout every part of the gameplay experience. Emperor of Paladins Edition and Joyeuse Edition for PlayStation 4 and Nintendo Switch will be available to pre-order from the Marvelous Games website very soon – keep up to date with the latest news at marvelousgames.com. Developed by Marvelous and slated for publishing in Europe and Australia by Marvelous Europe, a digital and physical version of Fate/EXTELLA LINK will be available for PlayStation 4 and Nintendo Switch, and a digital version will be released for PlayStation Vita. Publishing partner XSEED Games will also be releasing a worldwide digital version of the game for Windows PC via Steam. Fans can pre-order the Joyeuse Edition for £74.99 (€79,99) and the Emperors of Paladins Edition for £119.99 (€129,99) for PlayStation 4 and Nintendo Switch exclusively from the Marvelous Games website at marvelousgames.com.